Amateur astronomers around the world can now enjoy taking full control of the Schulman Telescope. As the largest dedicated public access telescope in the world, the telescope was designed from inception to provide full remote control over the internet by amateur astrophotographers worldwide. The telescope has been provided to the Mt. Lemmon SkyCenter by the Schulman Foundation, Joseph D. Schulman, President. Currently individuals can take direct control of the telescope operating the instrument through a web-based interface. Real-time imaging gives you feedback as to what is occurring at the observatory atop Mount Lemmon's 9,157 peak. You can see the images as they are acquired, watch the telescope and dome move, monitor the weather conditions, monitor guide stars, focus and much more. It is like being there, but sitting comfortably in your own home. Individuals can also elect to submit requests for data via scheduled (queued) observations. 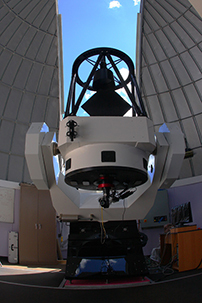 We are in the process of establishing an on-line portal for purchase and scheduling of the Schulman Telescope, however, you can purchase time on the telescope or schedule queued observations now by sending an email to the Mount Lemmon SkyCenter at mtlemmon.skycenter@gmail.com or by contacting us at 520-626-8122. In either case, please include the best way for us to reach you in order that we can contact you to assist in planning and successfully carrying out your observations.